Ganesa, the elephant-headed god, is a popular deity all over South Asia. Worshipped as Vighnesvara or Vighnaraja. Ganesa is propitiated before embarking on any venture as he is the remover of obstacles, the regulator of success, and symbolizes auspicious beginnings. In Ganesa in Medieval Nepal Milan Ratna Shakya explains the different aspects of Ganesa in the Malla age in Nepal, when the deity was known as Inaya, and all religious worship or ceremony began with him as Agra-Pujaka. Adi-Vinayaka or Adou-Vinayaka. The rise of the tantric cult during the medieval period in Nepal synthesized both Hinduism and Buddhism in Kathmandu valley. As a result, Ganesa is initiated and worshipped - with different symbolic objectives - even by Buddhists. Ganesa is also structured with the tantric living divinities of Kumari and Bhairava in Kathmandu valley even since the medieval age. 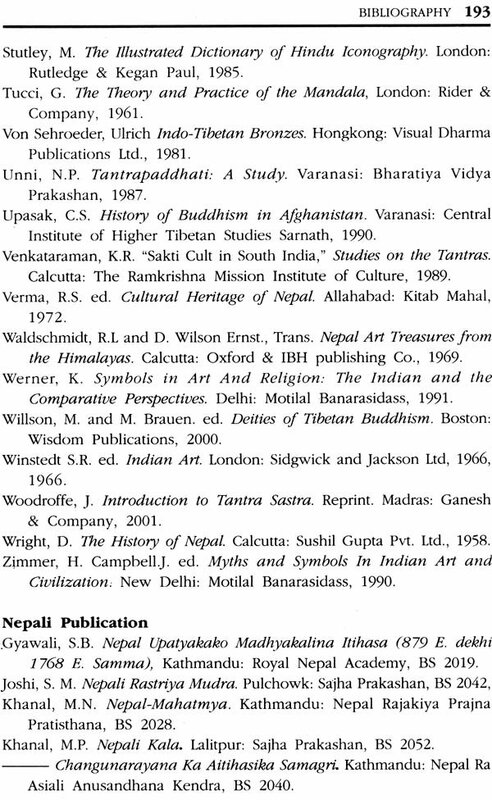 Ganesa in Medieval Nepal is not only relevant in Nepal, but in all regions where Hinduism is followed. This book is a complete study of the Ganesa cult. Milan Ratna Shakya was born in 1960 in Kathmandu. He is a Ph. D. an Artist / Lecturer at the Central Department of Nepalese History. Culture and Archaeology. Tribhuvan University. Kirtipur. He is also Member Subject Committee of Fine Arts Campus, Bhotahity. Member Subject / Standing Committee and Visiting Professor at Buddhist Studies Central Department, T. U., Kirtipur and Member of Academic Council at Royal Nepal Academy, Kamaladi, Kathmandu. He currently resides in Kathmandu with his wife and his two children. Ganesa is one of the most popular deity, as the harbinger of good-luck in Kathmandu Valley, even as early as the early historic age. He is famed as Ganedyoh or Inay dyoh, a fortiori god to the Newars, the Tibeto-Burmese speaking ethnic populace of medieval Nepal. Ganesa is revered in all facet of socio-cultural life of Newar symbolically as Twahinai, the god of principality. Ganesa as Koina, Buina, Thanina, Chohpoh, Tunkam pwoh, Lohansala including the Ganesa Yantra and Mandala worship by the Purana-Tantra tradition of medieval Nepal represent him conceptually as natural images, which depict him in his explicit symbolic form. This is also reflected in his tantric concept as a living god in human form. This is also reflected in his tantric concept as a living god in human form. In this respect, a Shakya boy is choosen as a living god representing Ganesa. In this guise, according to spiritual belief he is depicted as having a third eye made of gold and silver on his forehead to envisage the concept of supreme Self. Because, this Self is invisible to the common people, for they require the divya-dristi or the eyes of intellect, the third eye of knowledge to realize his true nature. His true appearance is that of a Yogi hence realized in eight fold aspects of Asta-Vinayaka as visualized by the meditative state of mind during his Samadhi, as the calm and composed form of a Yogi in Yoga asana, to realize the experience of transcendental consciousness. This third eye represents the Ajna-cakra, in Tantra-yoga which means that it reveals the mystic vision of Atman. Through which the absolute Truth is manifested. Hence this concept of Yogic Vinayaka is represented as the popular embodiement of manifested and Unmanifested world represented in icons and human form of art in Nepal. Hence, the medieval concept of Mana-vinayaka, Siddhi-Vinayaka, Asta uinayaka, caturbhuja-vinayaka occupies the norms of Astangika yoga or Sadanga-yoga in iconographic art forms as represented in a pair, four, six or eight, ten, twelve to sixteen armed images all around Kathmandu Valley. 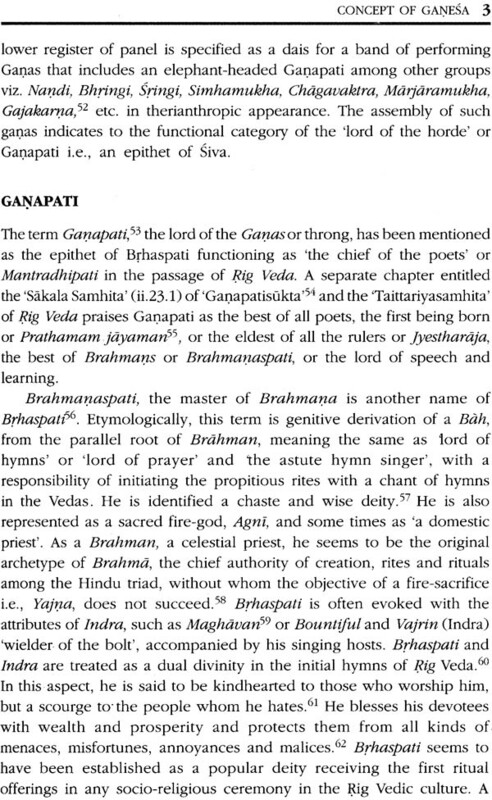 This study embarks to elucidate the concept, name and form of Ganesa as the most prominent and widespread deity, he is 'the first worshipped one' evoked before initiating any auspicious ceremonies or any under-takings by followers of both Hinduism and Buddhism. This study is broadly categorised under the followings heads: Introduction: mentions the research methodology and literature on Ganapati and Ganesa based on Vedic, Puranical, Tantric religions and art and aesthetic tradition. 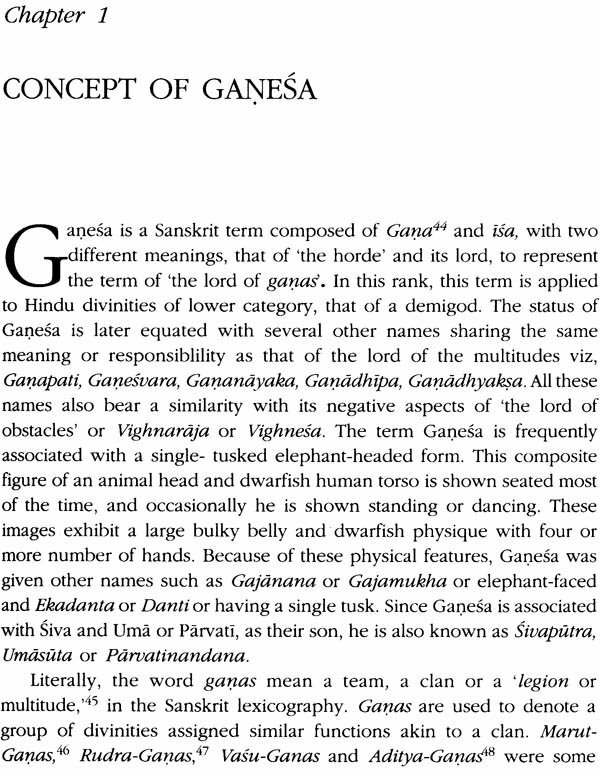 Origin: the origin, development and the concept of Ganesa. Ganesa in Kathmandu Valley: investigate the cult impression and different concept of Vinayakas historically. Inai cult practice: this cult is studied through the indigenous forms of Nature, symbolic forms, geometrical emblems, palatable form, auspicious creature, symbolic reflection in other godheads including the human form as a living god in medieval Nepal. 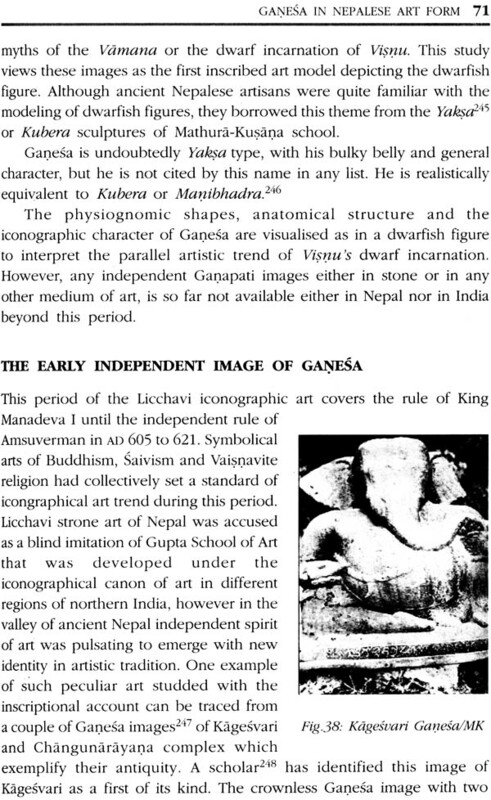 Ganesa in Nepali Sculpture and Paintings: these two chapters are dedicated to the art history of Ganesa in Kathmandu Valley. 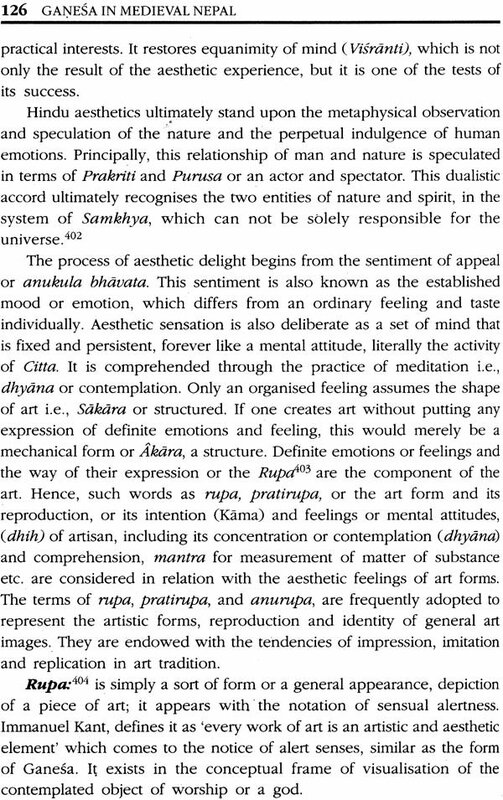 Aestheticity of Ganesa: it deals with the artistic union of Bhimsena, Nasahdyoh, and Ganapati trinity in Nepal. Ganapati, is seen as the god of dance, which also is a representation of aesthetics in Medieval Nepal. Its aesthetic concept and iconic forms have been discussed under this chapter and the concluding remarks of this study is placed at the end as the last Chapter. Ganesa, the elephant-headed god, is a popular Hindu divinitity all over South Asia. He has attained fame as Vighnesvara or Vighnaraja, 'the lord of obstacles' and Vighnaharta, 'the remover of obstacles' and regulator of success. Ganesa symbolises auspicious beginning and is believed to confer good luck on all ceremonies where his image is worshipped. From ancient times he has been the insurer of right beginning. 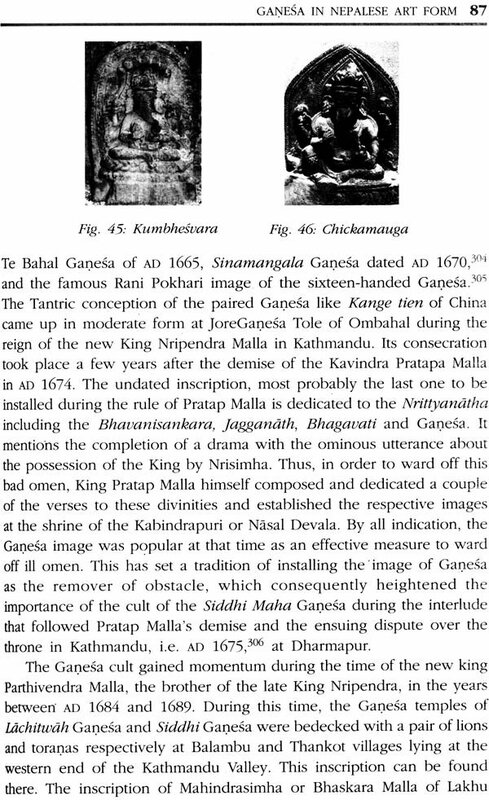 Attempts have been made here to study different aspects of Ganesa in Malla age (between AD 1200 and 1768) in Nepal. Tantric cult has synthesised both Hinduism and Buddhism in Kathmandu Valley. As a result, Ganesa is invoked and worshipped even by the Buddhist with different symbolic objectives; sacramental, embodiment of human beings as well as in aesthetics. Ganesa is also clubbed with the Tantric living divinities of Kumari and Bhairava ever since the medieval age. The integration of Tantric cult of Ganesa worship is represented here by art motifs deployed in sculpture and painting. All these facts makes this age an interesting study of religious culture of medieval Nepal. .The main problem was to decipher the popularity of Ganesa during the medieval history of Katmandu valley. Various sculptures and paintings of Ganesa accomplished at different periods are evidence enough of his popularity. The present study has explored the socio-religious and aesthetic significance of Ganesa. It has concentrated on the cultural tradition of the Newars during the Malla period. The aesthetic values of different forms of Ganesa art, represented variously in sculpture and painting , are however, one of the major problems of this research. Religious practices supported by philosophy naturally stand before the line of enquiry. It is obvious that the characteristic features, postures, attires, attributes, moods, and complexion of a divinity in South Asian culture are represented idiomatically and symbolically. This problem has also been addressed along with an interpretation of the native symbolism. The primary objective of this book is to explore the concept, behind the various art forms of Ganesa, particularly in the Malla period in the Kathmandu valley. Secondly, the research attempts an evaluation of the Ganesa art through iconographic, art historic, and other perspectives. It also aims at revealing the conceptual norms and values underlying the elephant-headed icons of Ganesa as well as his living form, represented by a young human boy, in Nepal. 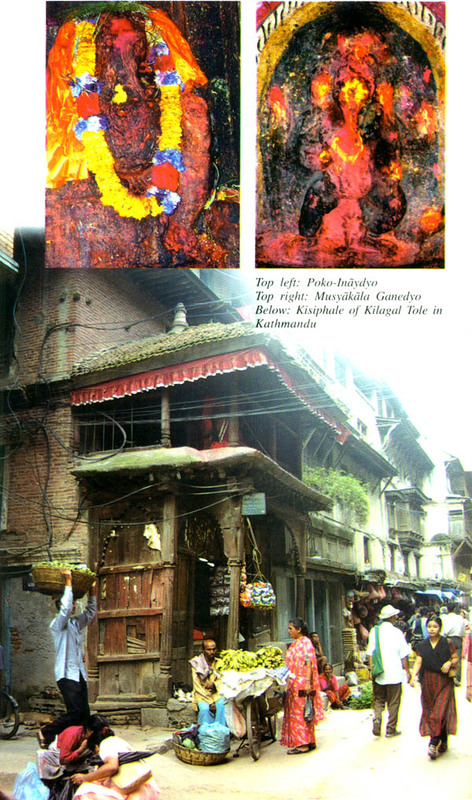 It naturally emphasises to the long tradition of Ganesa worship in the Kathmandu valley and its impact on the art and culture. The Newar cultural age reveals the coveted treasure troves of art, architecture and iconographic Moore in the Kathmandu Valley. The elephant-faced deity Ganesa's worship is prevalent within the Tantrik and Puranical cultures of Hinduism and Buddhism. This unique blend of Tantric cult had urged assorted forms of iconic representation of Ganesa . 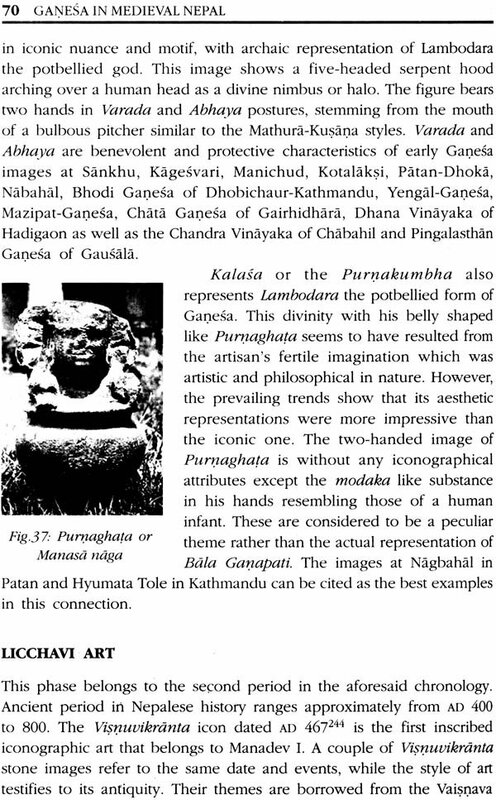 Although, the antecedents of Ganapatya sect are obscure in Nepal, its cultural importance has been accentuated by some tantric works and images. 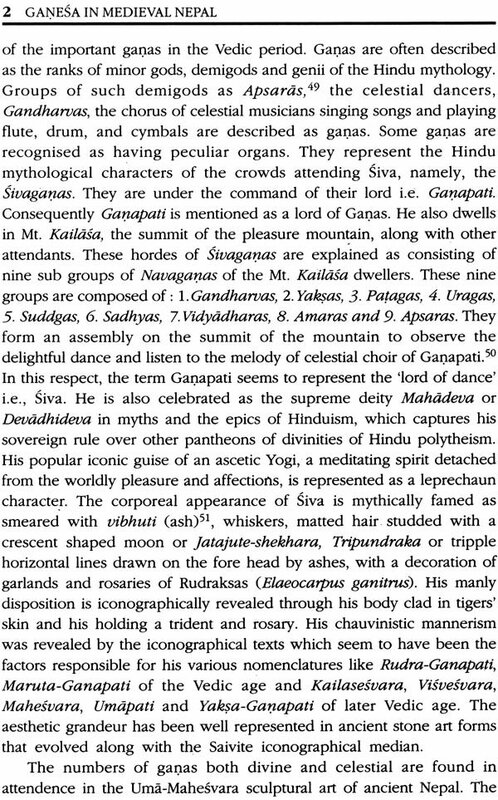 Various images of Ganesa, traced from outer brim of this valley, cohere with the cultural sequences of Malla age. This study delimits the basic norms and practices of Ganesa to the Newar socio - religious and cultural codes. This study is limited within the periphery of this valley geo-physically. However, its cultural ambits have been widened, abiding by the demand of topics, across the cultural rim of Sanga, Banepa, ala and Panauti. This cultural examination is primarily based on exploration and personal observation of different artistic and iconic objects, socio-cultural events and the practice of Ganesa images being installed in open fields of this valley while simultaneously consecrated in shrines, temples and exhibited in museums. The secondary sources are published books on mythology, iconography, art and art history of South Asia, religion, philosophy and social history of Nepal. 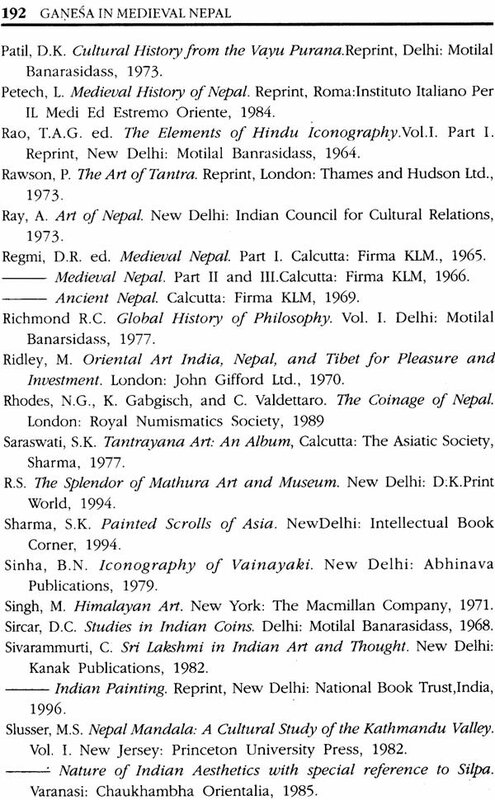 Different theories and art styles discussed in books based on art history of the South Asian countries have been an important source material for this research. The style of presentation of this work alternates between descriptive, comparative and analytical depending upon the nature of the topics dealt therein. Selective works on the concept, art forms, the iconic and aesthetic importance of Ganesa during the medieval culture of Kathmandu Valley have been reviewed. Research has been done, among other things through works that deal with the concept, rites and rituals that are concerned with Ganesa. These works include the Puranas, Smritis and other traditional scriptures and commentaries thereon that are published in Sanskrit, English, Hindi and Nepali. Other relevant works, which were not ignored, dealt with iconography. 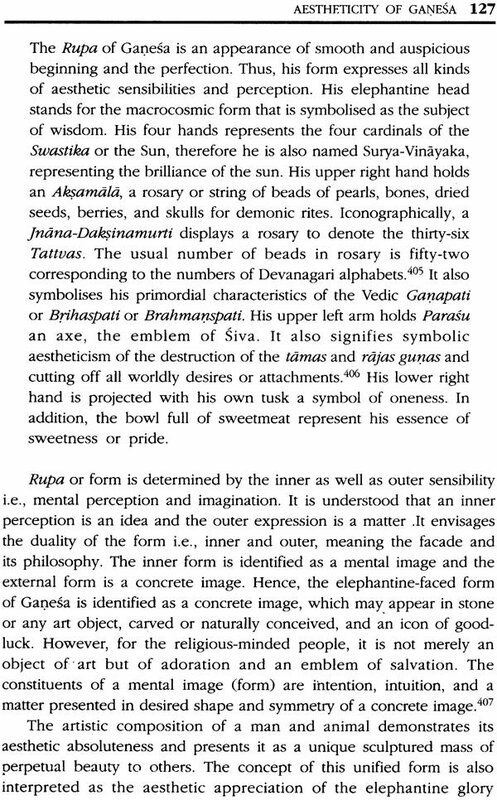 The third category of literature is rather theoretical in nature dealing with the art, its history and aestheticity of the concept of Ganesa. A few Buddhist works have also been included in the bibliography as they are expected to reveal the reason behind the popularity of this god among people other than the Hindus. The information they reveal may be helpful to reconstruct a history of the popularity of Ganesa during the Malla period. Ganesa Purana.' the Mythology of Ganesa elucidates his omnipotent and omniscient qualities. It emphasises the merits of images of Vinayaka, Ganesa and his worship for achieving success in different fields. It also tells different legends about the origin of Ganesa, his conflict with Kumara and Sivaganas, and his decapitation by Siva, followed by the transplantation of an elephant head on his torso and thus revival. The Agni Purana' a mythology named after the fire god deals with various technical aspects of preparing icons of different divinities, including Ganesa, and ritual for installing, consecrating and worshipping different divinities. A full section (chapter 71) of this Purana has been dedicated to Ganesa. The Agni Purana compiled between AD 700 and 1000, discusses the significance of the hymn or Mantra, known as the Ganesa Gdyatri Mantra. 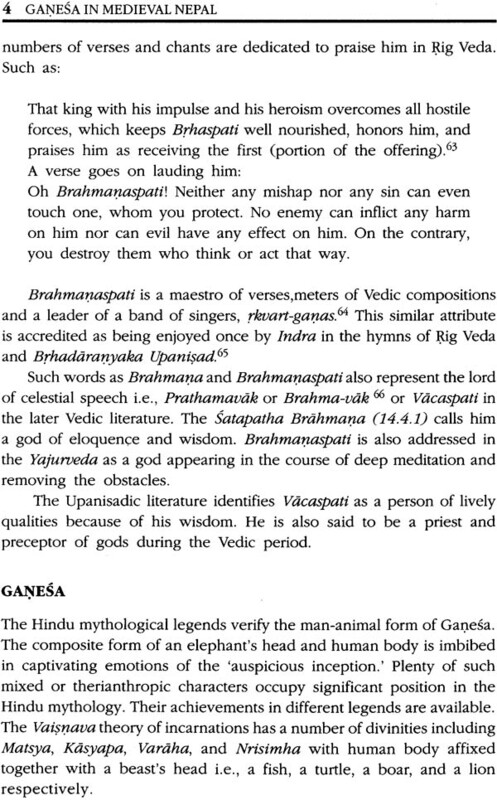 Bhavisya Purana dedicates about eight episodes on both the benevolent and malevolent aspects of Ganesa, vighnaraja, Vighna- Vinayaka and Ganapati. It describes the appropriate placement and time for worshipping different divinities including Ganesa and the merit of chanting holy spells or mantras in order to pacify the god's anger. It also describes the importance of the worship of Vinayaka on the day of Ganesa-Chaturthi. The Ganesa a special issue of Kalyana Kalpataru, a religious monthly, is dedicated to lord Ganesa. It has a collection of tories highlighting the significance of Ganesa and a number of thought-provoking articles by different scholars. The collection discusses the concept and elements of different names, forms and legends as well as the Tantric mysticism of Ganesa. It provides much information about Ganesa and procedures of his worship.